This entry was posted on Tuesday, February 19th, 2019 at 9:40 am and is filed under Humor, Politics. You can leave a response, or trackback from your own site. Yeah, math seems to be hard for far-left wingnut, Alexandria Ocasio-Cortez, along with most other pursuits normally considered appropriate for public consumption. But she thinks that utterly and completely unimportant because she’s “morally right.” Well, more like morally Left since her ethos seems centered firmly upon taking from the makers in order to give it to the ever-covetous takers. But then, this doesn’t really make Orcasio-Cortez and standout among her sort. This lack of concern for facts is the norm for their sort. This entry was posted on Monday, January 14th, 2019 at 9:34 am and is filed under Politics. You can leave a response, or trackback from your own site. 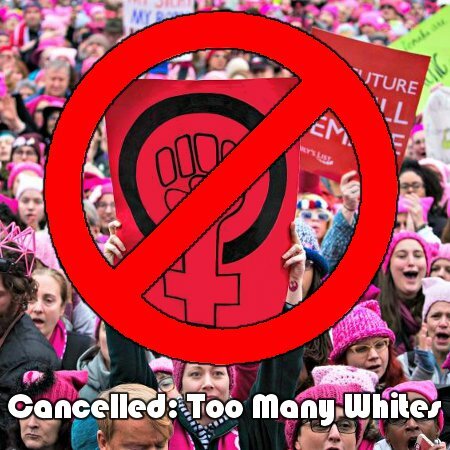 The upcoming Women’s March in Eureka, CA has been been cancelled by its organizers because it was Too White. After meeting with various SJW cells, it’s organizers chose to cancel the event because it participants did meet the non-White racial quotas needed to “properly” represent the demographics of Humboldt County. Humboldt County organizers and supporters of the annual Women’s March have decided to not hold a rally in Eureka on January 19th. This decision was made after many conversations between local social-change organizers and supporters of the march. The local organizers are continuing to meet and discuss how to broaden representation in the organizing committee to create an event that represents and supports peoples who live here in Humboldt. Up to this point, the participants have been overwhelmingly white, lacking representation from several perspectives in our community. Instead of pushing forward with crucial voices absent, the organizing team will take time for more outreach. Now me? I’m forced to wonder if those “many conversations” with “social-change” groups was more akin to dealing with threats from those groups, be it counter-protests or otherwise. After all, this would have been the #PussyHats’ 3rd year of their march in Eureka. So it’s not like there’s a real problem internally to this womyns’ group. Also, I’m really not sure what they think that can do to “darken” their march. It’s small, normally having only between 5000 – 8000 participants and Humbolt County is, like most of America, predominantly White. Indeed, at 82.7% White, it’s Whiter than the national average of 72.4%. Frankly, it just sounds to me as if these hand-wringing and angsty Feminists are just suffering from an “Identity Crisis.” 😆 Then, “Identity” is core these days to ideologies that lead people into groups like the Women’s March, even though it has almost nothing to do with their supposed mission. But please! Who are these people who identify as “Other?” Are they Martians? Romulans? Squidoids From the 3rd moon of Gliese 581g? This entry was posted on Monday, December 31st, 2018 at 6:11 am and is filed under Politics, Society. You can leave a response, or trackback from your own site. 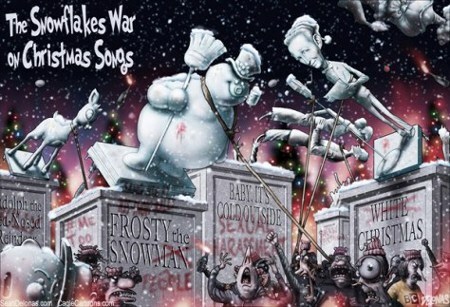 Here’s the thing – until we, the People enact a societal climate change, there’s always going to be snowflakes at Christmas. And they’re always going to be attacking some number of the trappings and trimmings of this American holiday, much like how they’ve been attacking its very name. This entry was posted on Friday, December 14th, 2018 at 8:10 am and is filed under Society. You can leave a response, or trackback from your own site. No, no! To the best of my knowledge, Alexandria Ocasio-Cortez never said this or anything materially similar to it. She has, however, said things equally as stupid. 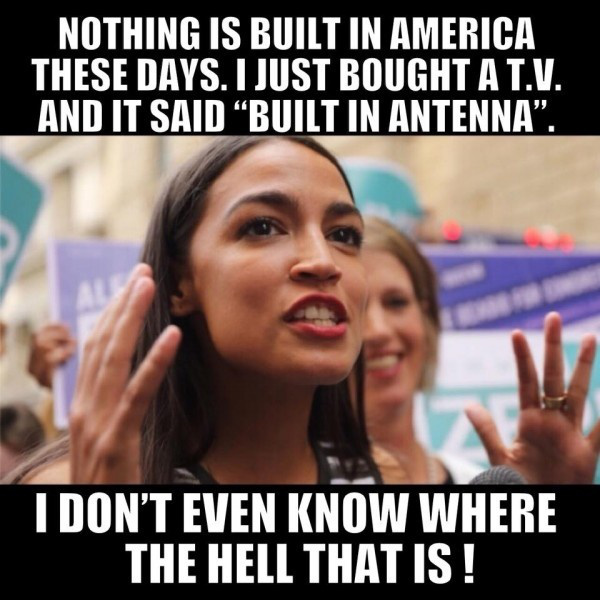 Indeed, her entire political position – as she presents it in her quest for a paycheck – is that ignorant, stupid, and mentally retarded. Hellfire! 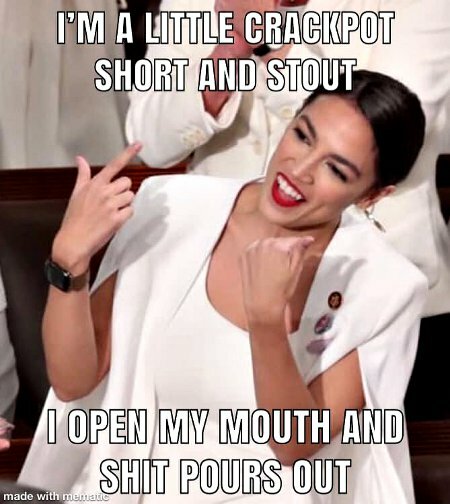 The mere fact that I have to make this disclaimer so that people know the image is sarcasm shows how insane, stupid, and mentally impaired Ocasio-Cortez and her constituency are. Still, there’s no informed or sane denial that the likely voters for creatures like Ocasio-Cortez, Bernie Sanders, or other Socialist have “special needs.” Be they middle-aged failures blaming everyone but themselves for the lot or the mentally ill Millennial Snowflakes looking to not experience work or failure, are suffering from extreme, chronic mental retardation. This entry was posted on Saturday, November 3rd, 2018 at 9:41 am and is filed under 2016 Election, Politics. You can leave a response, or trackback from your own site.